Some devices are different and may want to prove stubborn, so here's an extra tip just in case the steps above didn't work for you. 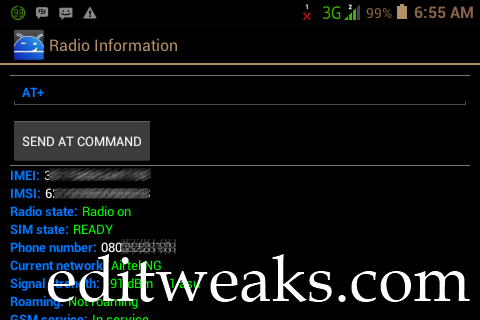 if you get errors saying "Sending Failed" or "module not supported for device errors"
Now Click SEND AT command, You'll get response "AT command is mSent"
Now restart your Infinix Hot. That's all. Now apply the imei to your phone using the steps we talked about above or previous page. You can get 3gb and use it to browse after you change it to IMEI of Blackberry phone. Activate a Glo BIS Plan. and you are good to go. Enjoy the Speed! Found this Helpful? You can click our Share Buttons to Bookmark this page and let friends know about it.